We are residents of Tisbury who take an active part in our community and its well being. We serve on town boards, run businesses and value and enjoy the quality of our town’s life. Some of us moved here recently while others were born here many years ago. On Tuesday, April 15, the voters of Tisbury will be asked to choose between two visions for Tisbury and its future. 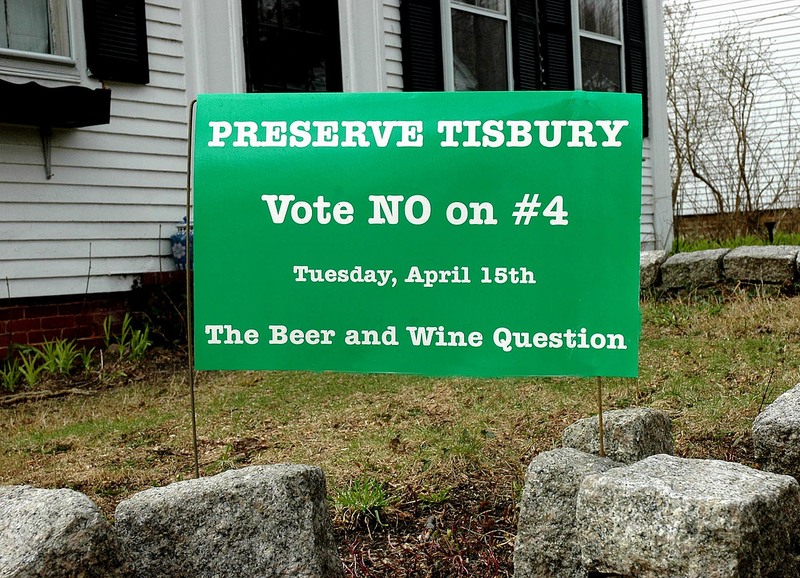 Many of us who live here have confidence that the unique and independent character of Tisbury will be preserved by voting no on Question Four for the proposed sale of beer and wine. The arguments in favor are not compelling. They are flawed, and in many cases disingenuous. There is no indication that selling beer and wine will result in a better business environment. We enjoy our local restaurants, and encourage that proven formula which has always been successful, i.e. good food at reasonable prices. We know this works and the BYOB choice is appealing to many. Contrary to certain claims, insurance is available at BYOB establishments at an affordable price, underwritten as a host policy. To allow the sale of beer and wine could change the restaurants and the whole business community of the town in all sorts of unanticipated ways. To compare our town with Rockport is not logical. Vineyard Haven Harbor is five times the size of Rockport with 730 moorings compared to 25. We are a port of entry with ferries arriving daily from New Bedford, Woods Hole and Falmouth. The Vineyard Haven waterfront, often described by our town fathers as our greatest asset, has been supported by the unanimous approval of our citizens at town meetings. The goal of protecting its vulnerable and fragile nature is important for many reasons, and our vital commercial and residential waterfront with its world renowned reputation in traditional boatbuilding and restoration, our tall ships, shipyards and marinas, is a popular destination for cruising families, summer renters and day trippers. Many of these visitors come to Vineyard Haven because it is a dry town where they and their families can enjoy the clean water, safe environs, tranquillity of our port and family friendly downtown. If we want to consider what Vineyard Haven would be like with the sale of beer and wine, it would make more sense to compare Vineyard Haven to Oak Bluffs and not to Rockport. Do we want our selectmen making these kinds of decisions for us given their ambivalent stand on this issue? We strongly encourage the citizens of Tisbury to ask what would be in the best interest of our children and grandchildren, who will inherit our legacy. Do we want to risk compromising our wonderful town for the questionable benefit of a few restaurants? The potential negative impacts are too great to ignore. For the past 200 years the vitality and distinctive character of our town has been nurtured by caring, resourceful and respectful citizens whose primary goal has been to sustain a high quality of life for the community at large. That is something worth voting for! Please vote no on Question four and preserve our town. I wonder if Tisbury could experiment and allow those 30-plus seat restaurants to serve beer and wine (with food) for two to three or three to five years. Do you think their off-season numbers would increase or just the summer season bottom line? I really enjoy a pint with dinner, but I don’t think I would go out to eat in Vineyard Haven any more than I do now. I used to feel as though I lodged at the Black Dog; it was breakfast, lunch, coffee after work and often dinner as well. For 30 years it has never been an inconvenience to BYOB it to any restaurant in Vineyard Haven. I actually prefer the novelty of it, the quirkiness, if you will. There is no question whatsoever that all of the restaurateurs work extremely hard at their chosen professions; let’s face it, most working class people do. We all know that change is inevitable and we are all going through these times together; it’s just that there are still some of us around who’s quality of life was never compromised by the “dryness” of Vineyard Haven and we like it that way. We are not afraid nor are we fear mongers; we are not prohibitionist nor are we against better profit margins for restaurants. We have just grown to love good ole Vineyard Haven the way it is. Yes, let’s hope that we continue to grow and prosper. I wonder if we can imagine a vibrant, unique yet quaint seaport town that is not hinged on the sale of beer and wine to us locals or the weary traveler. I wonder if we can imagine our beloved harbor town where a rising tide would truly lift all boats. If you have been reading the letters to the editors you have heard lots of opinions. And that is what we are voting on in Question 4. What is your opinion? No on can know if we will have bars in five years or not, or if hard liquor will be allowed in a year or not. These questions would be decided by our selectmen, not us. I am not comfortable with that so I will vote no on Question 4, Whatever your opinion is, now is the time to vote. It is your choice. Your voice. Please vote on Tuesday, April 15.